On the fourth of Thargelion, in the deme of Erkhia–located near the modern Spata, approximately twenty kilometers (twelve miles) east of Athens, with the deme center located at Magoula–a series of sacrifices were held. Most likely, these were in relation to the Thargelia which was soon to follow and to which I will soon dedicate a full blog post. Preporatory rites, of a sort. Elaion will hold a PAT ritual to follow in their footsteps on Wednesday 11 May, 2016 at the usual 10 am EDT. Will you be joining us? The Thargelia was one of the major festivals of Athens, and most of ancient Hellas. It celebrates the birthday of Apollon and Artemis and was held over the course of two days, one with the focus on Artemis–the first, as she was born first–and Apollon on the second day, held on the sixth and seventh day of the month of Thargelion, respectively. The thargelia was both an agricultural and a purifying festival: it was a festival intended to lift miasma from the city of Athens (and anywhere else it was celebrated) in order to ensure a good harvest. It was of vital importance and it could be that the people of Erkhia hosted these sacrifices in order to feel entitled to have Erkhia’s harvest fall under the results of the katharthic rites of Athens once they would be held a few days later. The ancient Erkhians would have held separate rituals for (almost) all of the listed deities, more often than not at different locations. It could therefore be that not all of these sacrifices are linked to the Thargelia. The sacrifices to Leto, Apollon and Zeus most likely were. 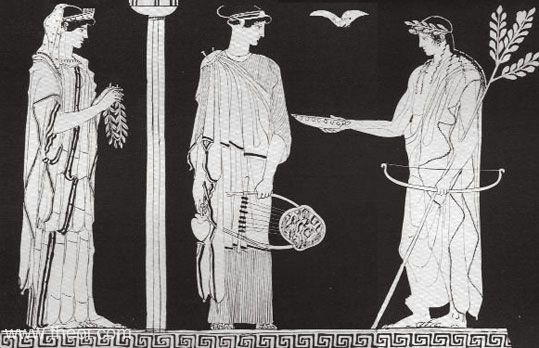 Hermes, perhaps, but it is more likely that He, along with the Dioskuri was honoured due to the influence of Sparta, of whom all three were patrons. Perhaps the sacrifice to Zeus had a joined function as the father of all (Depending on the mythological account, of course). We won’t be distinguishing between the two ‘branches’ and have made a single rite to be performed on the 11th, at 10 am EDT. You can join the community here and find the ritual here. We hope you will join us!